It's quite simple, really. I am still here. My garden is still here. I am still obsessively gardening. And every day, faithfully, I am writing all about it in my journal! The year 2006 is destined to be the Year of the Moosey Forum. I have other plans, too - in fact, I'm thinking of expanding the journal entries to daily pages, with a detailed resume of each week in the garden... Just kidding! Happy New Year from Mooseys Country Garden - the happy home of four mature cats, two kittens, one dog, a shrieking fence-line pheasant and a bleating super-sized pet lamb called Fred. This is terrible! I am feeling lazy, and have therefore decided there isn't much to do in the garden at this time of year. Absolute nonsense - what about the weeds? Where is my New Year's motivation? Quick - I need some gardening goals for 2006! The Manly Garden Help might be coming to the Moosey Country Garden this very week. Desperately searching for suitable garden tasks, I have finally thought of one - laying weed-mat and stones on the main Dog-Path. Armed with my Christmas present (not the Manly Garden Help, rather my scary book on Pruning), I am staring at the new Moosey Wisteria on the house pergola. Am I possibly a 'dedicated grower'? If so, then a supreme gardening challenge awaits. More serious nor-west winds blew throughout the night - my house lawns, which were raked, watered and freshly mown yesterday are once more covered with gum tree leaves and strips of bark. Aargh! No wonder I've never tried to have a 'real' lawn! It's a beautiful fresh summer morning. So where is my gardening optimism? And where is my World Garden Touring optimism? I wish I was more consistent - like my Pittosporums, for example, who never change their attitude to life and the garden. Water, weeds, wind, roses, and beautiful summer sunshine - these are some of the ingredients of the Moosey January garden. There are just a few more days left in January to stir the gardening pot! I love these days of summer freedom - perhaps being a random gardener is a good thing. Being a wise and sensible gardener would be nice as well! It's already the second week of February, and I think the garden is in better shape than usual, for this scruffy time of year. The rubbish piles on the fence-line are certainly bigger! Retirement! Next Friday I will become a totally committed, consistently on-task full-time gardener. Now I can definitely sweep the patios each morning. Cat company! Dog company! Lots more gardening! Lots less money - oops! Swimming, bicycling, tramping, reading, Brahms piano, cricket watching, Garden Club... Guess I'd better save some time for the Moosey Gardening. I am beginning to enjoy my new life very much! March is definitely marching on towards autumn! There are already some golden-yellow leaves on the birch trees, and the crab apples are starting to ripen. My birds will enjoy feasting on them! My end-of-March journal ramblings will be rather smoky, with hopefully many flames of inspiration leaping forth. In translation - the fire ban is removed, and burning is the issue of the day! Every day! April. Aargh! The slow burning, clearing rubbish month when the garden settles - no wind, gentle colour changes, and the Moosey lawns go green again. Hurray for my foliage plants! Inspired by Jack's Autumn pictures in the forum, I am off into my garden with my own eyes wide open. When I see pockets of golden and red colour from shrubs and trees, I am going to stop, look, marvel, and enjoy - maybe even photograph! The Easter weekend is now officially over, and I am left with huge numbers of sale plants to organise. Pot or garden? Perhaps a little bit of both! And where shall I plant my new hostas? Eek! May has crept up on an unsuspecting gardener and bitten her on the behind. That sounds indelicate - perhaps it tapped her on the shoulder as she gently raked up the autumn leaves? My first May weekend - I have huge plans, a garden task list longer than an allotment gardener's hoe - and the promise of good weather. How many days until my holiday? Eek! One pre-holiday May week is left in which to completely organise my gardening life. Ha! Show me a garden that is actually finished - only in the gardener's dreams! Blast the weather! And Happy Mothers' Day - that's officially for all New Zealand mothers, at least! Today was to be my big mulching day. That is, until the southerly - rain, cold - struck at first light this morning. I am back home, down in the winter depths of the southern hemisphere. Nothing has changed much in my absence, and there's quite a lot more mulching to do. My plants are remarkably colourful, considering it's winter. I will not be intimidated by cold southerly rain forecast, followed by snow to 400 meters. I am inspired, recently returned from visiting pre-summer gardens in England and Brussels. Should it snow I will retire to the glasshouse. The Welcome Garden becomes much more welcoming, as I fill the car more than once with New Zealand Native plants from the nursery. My plans to sneakily remove all the recycled newspaper piles in my road are thankfully put on hold - maturity has kicked in! The power did indeed go off, for a day and a half. The Moosey garden is completely snow-bound, with much visible damage. The Head Gardener is partially house-bound, making brave forays outside to uncover prized invisible flaxes. She is not happy! Right. Back to basics. No sulking. No daytime TV watching re-runs of James Bond movies. No feeling sorry for self. Much slashing of overgrown flaxes. Much stacking of logs, and much burning. Much sniffing and sneezing? Maybe - but no moaning! After indifferent weather this week, the weekend promises to be sunny! I'm going to finish the Wattle Woods clean-up, and then look critically at the new garden area with pen and paper in hand. I can feel a list of new plants! Finally my winter gardening sulks seem to be over. My old optimism is back, and my head is full of plans for new, improved planting schemes. Thank you, snow, for kicking me out of complacency and garden laziness. But please, no more this winter! With huge energy output I am racing through wintry July, doing an extremely early and optimistic spring-clean. If you are a fat flattened flax - beware! Be very afraid, as I continue rejuvenating older areas in the garden. Apart from sulking about my sore hands (caused by over enthusiastic weeding) I am ready to take on the August garden, whatever the weather - as long as there isn't another snow storm! Big hint - some spring flowers would be nice! In two gardening days time we fly out to Savai'i, the big island of Samoa. My floating shirts, tropical summer skirts and board shorts are ready. Goodbye, thermal underwear, woolly socks, and weather-proof winter vests! Yippee! I am back! That is, the grubby, winter gardening version of me. The tropical island version, she of the flowing turquoise cotton shirts and funky beach board shorts, lives on in a large scribbly notebook labelled 'My Samoan Holiday'. Our long awaited holiday to Samoa - I have no idea what to expect. I've even left the Lonely Planet Guide at home, sadly unread. I've done no botanical research - oops! Will this be a nice holiday for an obsessive gardener? A tropical island paradise, living on the beach with coconut palms swishing and murmuring in the warm breeze. Ha! What a pleasant life! I have hardly had time to think about the Moosey garden in the depths of winter! It's wonderful to see tiny featherlight touches of spring in my garden, though the daffodils are still very sluggish - that's a very poor choice of adjective for a gardener! I have hopeful feelings that spring is nearly here. Our lambs are due, and finally there are tiny bursts of daffodil yellow. Things in the garden just feel different. And I've spied the first blossom. Yippee! Animal developments - we meet the new hens and rooster who are coming to live at Mooseys. And one of the new merino lambs has a rough start - welcome to Haru, this year's pet lamb. Spring officially starts in New Zealand on the 1st September. I've read that in England it's three weeks later. That must mean that we get much warmer spring weather - and better gardening weather in general? New plants - the gift that goes on giving! My new trees are in, my new shrubs are - almost in, my new roses are - next to go in. Our new poultry arrives any day now, and we are still waiting for more new lambs. The spring garden gets more lovely each day - I love this time of year! The daffodils are now in full bloom, and the blue grape hyacinths are starting to flower - these blues and yellows are echoed in my pansy flowers. Simply beautiful! I can't believe how busy I've been in the garden these last spring weeks. Typical question to retired lady gardener - But what do you do with yourself all day? Spring is accelerating - whatever happened to the constant, boring ticking of time? And the number of garden things I'm finding to do each day is increasing exponentially, as is my happiness! Ha! Busy women should make brilliant gardeners. There is so much spring growth now in the garden, with more and more bursts of colour from shrubs and flowers. And there are so many things that I should be doing... Oops. The first October week ends with some rather nippy weather. Rain, of course, is always good for the garden and bad for the gardener - for this gardener, at least, who does not fancy being muddy and cold. October's Resolution - I must stop expanding my garden areas and concentrate on good maintenance (weeding and raking paths) of what's already there. All individual plants, even the small and humble, are to be heard. What a beautiful month! Traditionally a big working month (before I retired) I used to be flustered by October, trying to keep up with the changes. Beautiful October - I hope our new relationship continues for many more years! My late spring garden is so beautiful. I'm working so hard planting new shrubs and grasses, and the results are amazing. I think I am a gardening legend - long may this optimism continue! This is the first spring that I've been properly home in my garden, ever. I am enjoying the quick-fire changes in the garden - colourful flowers bursting out of the greenery, and shrubs blooming without warning. These garden days are getting more and more colourful, with new flowers appearing, and rhododendrons in bloom. My garden has suddenly put on its coat of many colours. Wind - buzz off! Kindly blow somewhere else! I love my garden with its flowers, colours, friendly animals, buzzing insects, tweeting birds, and general rustic country charm. I am very lucky - unlike the aphids on my recently sprayed roses. I think it's the beginning of summer! Go, you roses! Summer weather - get on with it! I have my new, sensible, floppy gardening hat freshly washed and ready. November is a stunning month, and this year, for the very first time, I have all the time in the world to do the garden. There are so many flowers - roses, rhododendrons, irises, peonies - and the lawns are still nicely green. It feels like the edge of summer. My garden is growing well and looking fresh and beautiful. I love the new colours and flowers appearing every day - what a wonderful month! What a wonderful garden world! My goodness, my summer flowering shrubs are making their colourful mark. Shrubs - I love you all! My roses may seem to get all the attention in November, but it's thanks to you shrubs that the roses look so grand! The Moosey roses are still looking wonderful! And no panic from the Moosey gardener that all the leaves or flowers are about to dissolve or to fall off - as yet! I wish that the amount of November gardening taking place was equivalent to the amount I am writing this month. What's happening in the early summer garden? Could it be just a lot of talk about nothing? Two serious summer pastimes have begun in earnest - weeding out the annual forget-me-nots, and dead-heading the roses, all of which are still looking beautiful. There is no other way to say it! This is serious - I need my own little lawn mower to do the immediate house lawns and the edges. I am based here at home, in the garden (theoretically) every day, with all the time (theoretically) in the gardening world. Sorry for any gloomy threads which might have trickled into the journal of late. Some silly old gardeners just don't know how lucky they are! I am at peace again in my sparkling summer garden - a little dead-heading goes a long way. Summery sunshine one day, brooding rain clouds the next - what will our silly weather think of next? Don't even think of the frost word. And no hailing on my hostas! Forget any thoughts of wind, too - let's get into a nice calm summer mood. Lacks self discipline and the ability to remain focused - this sounds like an end-of year school report! 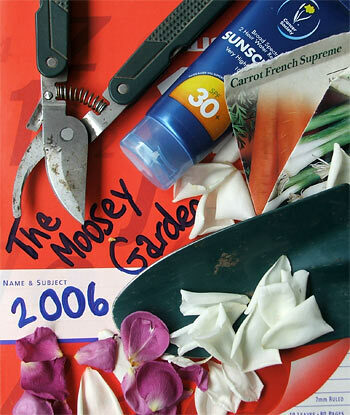 It describes the Moosey Head Gardener, who has fallen into a moochy, lazy mood. Summer temperatures are hotting up, as are summer lists of things to do. Already there are casualties, like bolting spinach, and a pair of grubby, stained sunhats. Cream might not have been the best colour! I'm still busy trying to finish my serious mid-December list of gardening things to do. But there's a summer holiday feeling starting to creep in. Ooops! The summer weather has suddenly become a disgrace. Just hours away now from the longest day - that's mid-summer, by the way - and we are having hail, cold driving rain, and ghastly freezing winds. The garden preparations for Christmas Day are finally done, in a frenzy of weeding, dead-heading and clearing. Summer has returned. Merry Christmas!